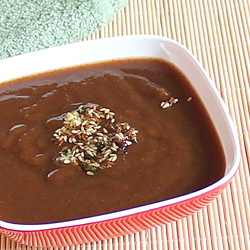 This date chutney recipe (khajur chutney recipe) makes sweet and mild sour Indian dip by mixing dry mango powder and few other spices with pureed dates. The garam masala and dry ginger powder gives it a nice little spicy touch which compliments the sweet and sour taste of dates and mango powder respectively. Serve it with dry samosa, dry kachori, dahi vada, etc. and make them tastier. Chop date into small pieces and remove seeds. Boil them in 2 cups water over low flame until soft (approx. 10 minutes) or cook it with 2 cups water in pressure cooker for 2 whistles. Let it cool and then puree them with water using blender or mixer. Transfer puree in a medium size pan and bring it to boil over medium flame. Add dry mango powder and cook over low flame for approx. 4-5 minutes. Stir occasionally in between. Turn off flame, add red chilli powder, cumin powder, coriander powder, garam masala, dry ginger powder and black salt; mix all ingredients well. Taste it for salt and spices, add more salt/spices if required and turn off the flame. Let it cool at room temperature. 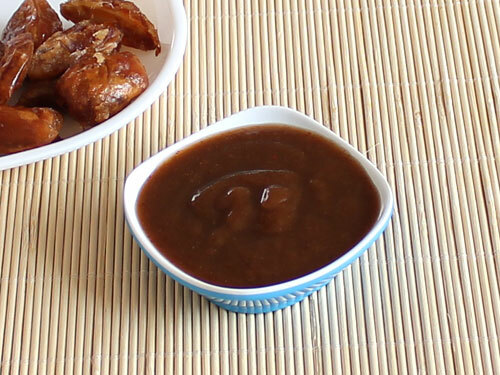 Transfer cooled date chutney to serving bowl and serve with snacks you have prepared. Or transfer it to airtight container and store in freezer for up to 1 month and use whenever you need it. Time may vary to cook date (in step-1) according to thickness and type of pan. If you like tangier taste, then add more dry mango powder while preparing date chutney. Replace dry mango powder with tamarind or vinegar for variation. Change the quantity of water accordingly to make thick or diluted chutney. Serving Ideas:It is a must have condiment for making delicious dahi vada and bhel puri or serve it as a dip for samosa, kachori, etc. and make them yummier. Amazing place to solve an urgent mess.